“There's little evidence to suggest anyone actually wants a strong dollar, just a stable currency that will make business more transparent. The wave of inflation triggered by the current easy money policy has only just begun to materialize but, because of the consumer's link to interest rates through their home mortgages, it will be all but impossible for the Fed to make any more than token hikes in their target rate. What's more, because the spread between Fed funds and Libor remains stubbornly wide, it's quite possible the Fed will not be finished cutting rates this week, even if it pauses, as interbank lending continues to be fearful. Though clambors for the Fed to hold rates steady last week reemerged ahead of the policy statement, events materialized as described in the previous update, with the Fed cutting rates, but not being able to take further accomodation off the table, let alone signal rate hiking. The central bank's sentiment that inflation will moderate in coming quarters remains its only viable option for ratcheting down inflation expectations given the economic environment. With “Seize the rotation” becoming the operative paradigm on Wall Street last week, traders sold euros and with them gold, the currency risk associated with owning precious metals over the past several months correlated to the large extent in which the recent rallies have been produced by dollar hedging and not physical demand. Read Dom's Market Update for more on why the reversal in the euro was technically driven, rather than based on an end to the precious metals bull market, as some now predict. In the interest of objectivity, the last update featured two extreme opposite counts in gold, one short term bullish the other short term bearish, and one was invalidated last week as hoped. The focus therefore turns toward better understanding the nuances of the count which remains. Having expected a correction in gold, the immediately bearish chart from last week was operative at TTC. Now that gold has been decisively rejected at $900, and with the Street dreaming up a case for sector rotation, the debate seems to again be whether the bull market in precious metals is over, the two sides of which are depicted in the chart below. The red count is the impulse down which would signal a possible end to the precious metals bull market. 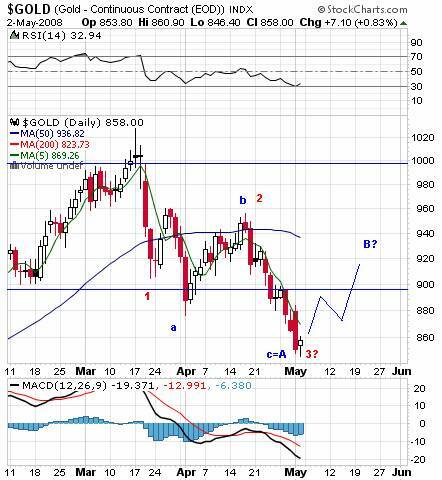 If this argument is correct, we should see the slide in gold continue this week, perhaps after some sideways consolidation, to about $820-830. This would not be the ultimate bottom for gold, however, just a stopping point on the way down. In contrast, the blue count illustrates a completed three-wave move down in gold, and though these waves can still be counted in different ways currently, with alternative counts currently available to TTC members right now in the gold forum , the important characteristic is the correction within a bull market. Notice the blue count is now calling for a b wave rally with wide latitude for potential targets. 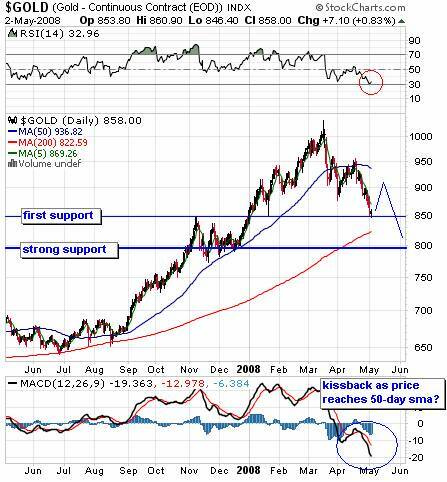 If the rotation trade fizzles and such a rally in gold materializes, while it would tend to discredit an impulse down, it may trap many longs into thinking the larger correction is over, whereas the chart below shows we've likely only reached an intermediate term bottom after reaching previous resistance and oversold levels in the RSI. We noticed last week silver had technically fared better than gold, despite the steepness of its initial decline. At the time, the white metal was clinging to a trendline from last fall and resisting the new lows. That came apart as silver followed gold lower in the dollar rally environment. The wave count is also similar to gold, though less clear because of silver's heightened volatility. 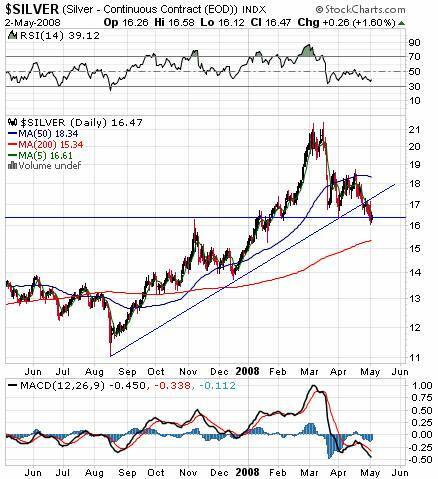 While silver can easily drop into it's 200-day sma near $15.35, it's also reaching oversold levels and should be due for a relief rally soon, in which case resistance at $17 and at the broken trendline will be crucial. TTC will close soon to new membership. So, do you want daily updates on precious metals and other markets? Do you want to learn how to trade short term time frames? Would you like access to next week's charts posted in the weekly forum right now? Ten to twenty big picture charts are posted every weekend. But the opportunity to join the TTC community of traders is quickly slipping away from retail investors as we're set to close our doors Memorial Day weekend to all but the institutional traders that have become a large and important part of our membership. If you're really serious about trading, learn more about what TTC has to offer and how to join now .